Q: According to reports, the United States decided to put the DPRK back on a list of state sponsors of terrorism yesterday and it may ramp up sanctions on the DPRK. What's your comment on this? A: We have noted the relevant reports. The current situation on the Korean Peninsula remains highly complex and sensitive. We hope the relevant parties will do more to help deescalate tensions and come back to the track of peacefully resolving the Korean Peninsula nuclear issue through dialogue and negotiation. 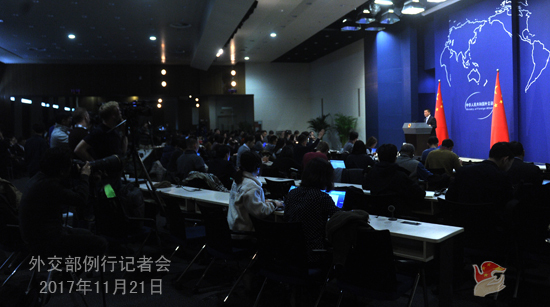 Q: You released the information on Premier Li Keqiang's upcoming visit to Hungary yesterday. Is this his first visit to that country as premier? What's China's expectation for this visit? A: Hungary is an important country in Central and Eastern Europe and the host of the Sixth Summit of China and Central and Eastern European Countries as well as China's comprehensive strategic partner. China highly values its relations with Hungary and treats it as an important cooperation partner in Central and Eastern Europe and the European region as a whole. In recent years, the two countries have maintained close leadership-level interactions, conducted in-depth cooperation in various fields and carried out rich cultural and people-to-people exchanges. This is Premier Li Keqiang's first visit to Hungary since he assumed office. During his visit, Premier Li Keqiang will hold talk with Prime Minister Viktor Orban and meet with other Hungarian leaders and exchange views on China-Hungary relations, the cooperation between China and Central and Eastern European Countries and issues of mutual concern. The two sides will also sign cooperation documents in relevant fields. We believe that Premier Li Keqiang's visit will further enrich the China-Huangary comprehensive strategic partnership and promote across-the-board practical cooperation between the two countries for more fruitful outcomes. Q: A former senior official of the Hong Kong Special Administrative Region was arrested in New York over alleged involvement in a bribery scheme on behalf of a Shanghai-based energy company. Is China informed of the situation? Could you share more information with us? A: We have noted the relevant reports. I'm not aware of the details. As a principle, China always requires Chinese enterprises to legally operate their business abroad and abide by the local laws and regulations. Q: First, according to reports, when declaring the DPRK a sponsor state of terrorism yesterday, US President Donald Trump said that the Treasury Department will announce new sanctions against North Korea today. What's your reaction to this? Second, did President Trump tell President Xi Jinping about the relevant move? Third, President Trump's announcement coincides with Minister Song Tao's return from the DPRK. What's your response to this? A: As for your second question, during President Trump's visit to China, President Xi Jinping and he exchanged views on how to develop China-US relations in a more in-depth way and other issues of mutual concern including the situation on the Korean Peninsula. We have issued press releases on the details. I have no more information to offer with regard to the talks between the two presidents. On your first question, President Trump said the Treasury Department will roll out further measures on November 21 (EST). As I said, we are not getting ahead of that and will see what is about to come. Like what I said, the situation on the Korean Peninsula remains highly complex and sensitive. Various parties should recognize that the deescalation of the situation will help bring parties back to the negotiating table, which serves the interests of all parties. I don't see any necessary connection between the timing of President Trump's announcement and Minister Song Tao's visit to the DPRK. Q: According to information, the 8th round of strategic dialogue between China and Pakistan was held yesterday in Islamabad, which was attended by senior officials from both countries. Do you have more information to share with us? A: On November 20, the 8th round of China-Pakistan Strategic Dialogue was held in Islamabad. Assistant Foreign Minister Kong Xuanyou co-hosted the strategic dialogue with Foreign Secretary Tehmina Janjua of Pakistan. In the dialogue, Assistant Foreign Minister Kong Xuanyou said that China and Pakistan are all-weather strategic cooperative partners and we have always lent support to each other when it comes to issues of respective core interests. China always makes Pakistan a priority in its neighborhood diplomacy, and China's development should first benefit a good friend that shares weal and woe like Pakistan. 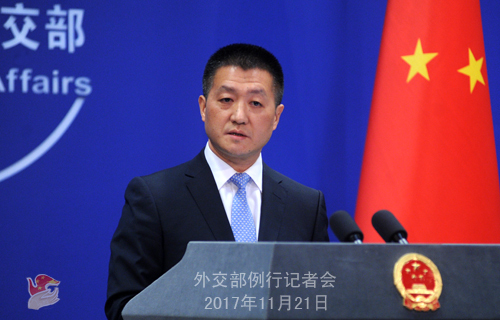 China wishes to develop China-Pakistan relations with a strategic vision and from a long-term perspective and work with Pakistan to move forward the bilateral relations and proactively build the China-Pakistan community of shared future. Foreign Secretary Tehmina Janjua said that China-Pakistan Strategic Dialogue serves as an important channel for the two countries to enhance strategic communication and coordination. Pakistan stands ready to make the most of this mechanism and move forward the communication and cooperation as well as strategic coordination between the two countries. In this round of dialogue, both sides spoke highly of the China-Pakistan all-weather strategic cooperative partnership and expressed that the two countries will continue to well implement consensus reached by leaders of both countries, enhance friendly exchanges at various levels, actively facilitate the construction of the China-Pakistan Economic Corridor, deepen practical cooperation in various areas and jointly build the China-Pakistan community of shared future. The two sides also exchanged in-depth views on international and regional issues of mutual concern. As far as I know, both sides have issued detailed press releases after the dialogue concluded. You may look into them. Q: According to Japanese media, Japanese Foreign Minister Taro Kono said in an address at Kanagawa Prefecture that, the Chinese-proposed Belt and Road Initiative will be highly conducive to global economy if carried out in an open manner that is available to all. What is your comment on this? A: We have noted the relevant reports. We welcome Japan's positive attitude towards the Belt and Road cooperation. The Belt and Road is an important international public good China has offered in a bid to promote development cooperation, and it is set to be an open and inclusive cooperation platform from the very beginning. China always upholds the principle of wide consultation, joint contribution and shared benefits and acts in the silkroad spirit of peace and cooperation, openness and inclusiveness, mutual learning and win-win cooperation to deepen mutually beneficial cooperation with various parties. We believe the in-depth advancement of the Belt and Road will not only create greater room for China's opening and development, but also present more opportunities for the development of Japan and other countries as well as the global economy. Q: The President of Panama is visiting China this week. In some press conferences and interviews he said that all the countries in Central America and the Caribbean may soon follow Panama and establish ties with China. Can you confirm this and tell us which countries are negotiating with China? A: China is committed to developing friendly cooperation with countries around the world on the basis of the Five Principles of Peaceful Co-existence and one-China principle. The development of relations between Panama and China since the establishment of diplomatic ties has shown that as long as the one-China principle is held, there is solid foundation and ample room for other countries to develop relations and cooperation with China. Q: A series of attacks have been carried out against the candidates contesting provincial and federal parliamentary elections in some areas of Nepal. How do you comment on the election situation in Nepal? 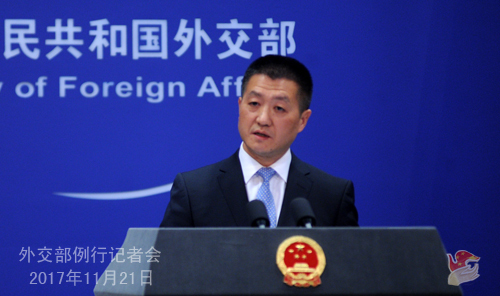 A: The Chinese side has noted the relevant reports. As a good neighbor and good friend of Nepal, China supports Nepal in choosing a development path that suits its own national conditions and sincerely hope that various parties in Nepal will work in unity to complete the election to help the country set out on a new journey of political stability and economic development. Q: According to the Australian media, negotiations between Australia and the Taiwan authority on a "free trade agreement"have been on hold for many years because of pressure from the Chinese mainland and Australia's reluctance to offend the mainland. What is your response? Some members of the Australian parliament believed that though Australia has already signed a Free Trade Agreement (FTA) with the Chinese mainland, it would not constitute a violation of the one-China policy if Australia signs another with the Taiwan authority. What is the mainland's position on possible FTA negotiations between the Taiwan authority and Australia? A: We firmly oppose any official contacts and exchanges between the countries having diplomatic relations with us and the Taiwan authority. We firmly oppose their negotiating and signing of any official agreements with sovereign implications as well. We hope that the relevant country will fully grasp how sensitive and complicated the Taiwan issue is, stick to the one-China principle, and properly handle the relevant issue with caution. Q: According to reports, on November 20, Kenya's Supreme Court ruled that the presidential election rerun on October 26 is valid and upheld the reelection of Jubilee Party's candidate, the incumbent President Uhuru Kenyatta. What's your comment? A: The Chinese side has noted the final ruling issued by the Supreme Court of Kenya and is pleased to see the settlement of the dispute over Kenya's presidential election within the legal framework. We congratulate President Uhuru Kenyatta on his reelection and sincerely wish that Kenya will maintain peace and stability and make greater achievements in national development. Q: Air China appears to have stopped flights to Pyongyang. They are closing their offices there, at least temporarily, and the Chinese staff will return to China. I wonder if this move by China is part of Chinese government's policy towards the DPRK? A: I have not heard of what you said. Even if it is the case, the airliners just make work out their own operation plans based on the state of operation and the market. Q: Yesterday we heard that there might be further information forthcoming when Special Envoy Song Tao returns from the DPRK to China. Is there gonna be more information about that trip that is available to us? When will that be? A: I said yesterday that before and amid Minister Song Tao's visit to the DPRK, the Xinhua News Agency of China and the Korean Central News Agency of the DPRK have respectively released relevant information. 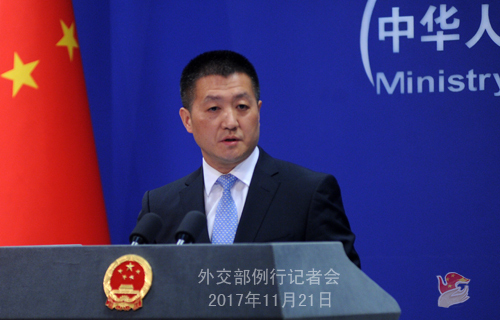 After Minister Song Tao returned to Beijing from the DPRK, the Xinhua News Agency was authorized to publicize information regarding his visit. I have nothing further to add. If you want to know more, I would refer you to the competent authority. Q: According to reports, a former senor official of the Hong Kong Special Administrative Region was arrested over the weekend on charges of bribery regarding deals with Chad and Uganda. What is your comment? A: As I just said, I am not aware of the specifics of the situation you mentioned. But I want to stress that the Chinese government always asks its enterprises overseas to run their businesses legally and observe local laws and regulations.